The financial co-ops are initially based consumer co-op offering financial services to their members. The financial co-ops were started in rural communities providing farmers with micro credit during the beginning of the 1800s and they were known as people’s bank or credit union and saving and credit Cooperatives. These special types of co-ops often come under legislation developed for the uniqueness of the financial services being provided to their members, deposit taking, loans, trust services, and insurance. Credit Unions (in English Canada) / Caisses Populaire (French Canada) are the most recognizable or best known of the financial co-ops. Like other co-ops democratic control is in the hands of their members/owners. These co-ops have the mandate to provide their members with financial services at the lowest possible cost and the highest possible return. These services include a variety of deposit vehicles, mortgages, loans, lines of credit, safety deposit boxes, financial planning, estate administration and insurance. 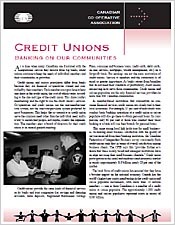 In Manitoba Credit Unions and Caisses Populaires are incorporated under the Credit Unions and Caisses Populaires Act of Manitoba while the trust co-ops and insurance co-ops are incorporated under federal legislation. For more information please read about Financial Cooperatives (PDF).